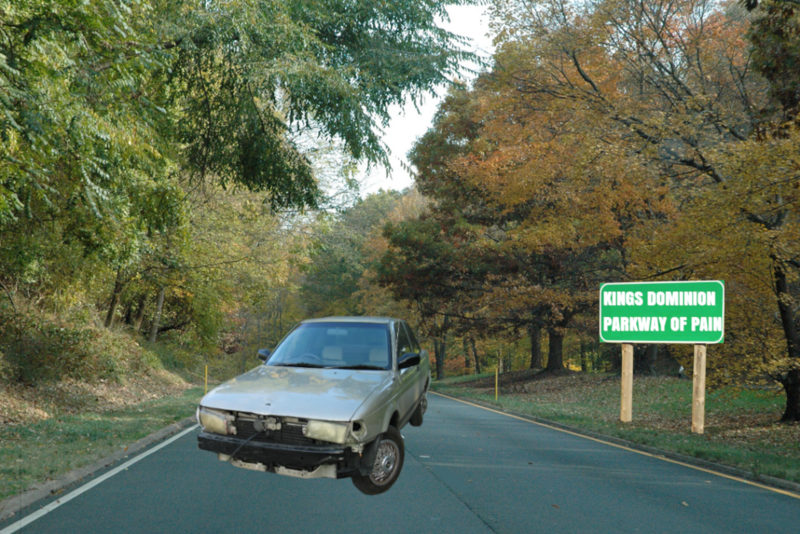 DOSWELL, Va. — Amid curiosity and an initiative to develop attractions closer to Washington D.C., Kings Dominion has announced their most fear-inducing ride yet: driving highway speeds over more than 70 jolting potholes on the George Washington Memorial Parkway. Support our mission to compromise journalism by subscribing to our Patreon. No axles are safe on Kings Dominion’s new attraction Parkway of Pain, which they acquired from the National Parks Service early this year. Boasting a slew of unfilled potholes that stress test both the car and the driver behind the wheel, the ride is expected to be harrowing. Beginning in April 2019, the parkway will close to ordinary traffic, and park employees will allow riders to enter the course at one of many stations along the road. After entering the parkway, drivers will be treated to a litany of violent jerks and jostles as they cruise their cars over the unkempt pavement. Drivers will get to experience everything from tame divots to completely exposed metal rebar that should never see open air. “Parkway of Pain is truly revolutionary with its modern ‘deconstructed’ design,” Callaway explained. Kings Dominion’s owners don’t plan to make any changes before the road begins its new life as a thrill ride. The stuff in our online store is cheaper than anything you could ever buy at Kings Dominion.